This antibody was eluted out with both high and low pH buffers and neutralized immediately after elution, followed by dialysis against PBS. Our Abpromise guarantee covers the use of ab38510 in the following tested applications. WB 1/100 - 1/500. Predicted molecular weight: 108 kDa. Hydrolase that deubiquitinates target proteins such as the receptor ADORA2A and TRIM21. Deubiquitination of ADORA2A increases the amount of functional receptor at the cell surface. Plays a role in the regulation of quality control in the ER. Overexpressed in small cell tumors and adenocarcinomas of the lung compared to wild-type lung (at protein level). Expressed in the hippocampal neurons. Belongs to the peptidase C19 family. USP4 subfamily. Monoubiquitinated by TRIM21. Ubiquitination does not lead to its proteasomal degradation. Autodeubiquitinated. Cytoplasm. Nucleus. Shuttles between the nucleus and cytoplasm. Exported to the cytoplasm in a CRM1-dependent manner and recycled back to the nucleus via the importin alpha/beta heterodimeric import receptor. The relative amounts found in the nucleus and cytoplasm vary according to the cell type. 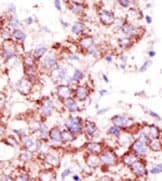 Ab38510 staining Human hepatocarcinoma; formalin fixed, paraffin embedded. Ab38510 was peroxidase-conjugated to the secondary antibody, followed by AEC staining. Publishing research using ab38510? Please let us know so that we can cite the reference in this datasheet. There are currently no Customer reviews or Questions for ab38510.